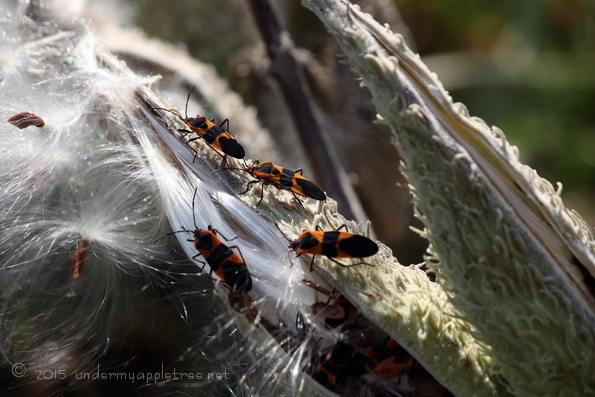 Almost wordless: Destructive little critters were eating the Milkweed seeds. Interestingly, they have the same coloring as the Monarchs, who also feed on the Milkweed. And like the Monarchs, the sap they eat from the Milkweed makes them toxic to predators. These were in the prairie. I prefer they not visit my milkweed patch. It all works together, doesn’t it! Funny how they resemble the monarchs. Interesting that they have the same coloring as Monarchs! Another excellent photo! Fascinating how the natural world all works together, isn’t it?